There is a marked contrast between country and town—we will not say city—and this is most noticeable during the hot months of summer. The population of the towns are hemmed in on all sides by prying neighbors, and their acts are .often “deemed to be public acts,” if one may judge from the freedom their neighbors discuss them. They have but little room to develop themselves, and when opportunity affords, are on the wing visiting some country friend or rusticating along the water courses. The inhabitant of the country enjoys a life of freedom. He is up at the early dawn, and-breathes the pure fresh air of the morning. He sees the sun as she first peeps above the eastern horizon, and throws her scintillating rays over the earth. He beholds her as she ascends the ﬁrmament lapping up the morning dew, and dressing vegetation with the rigor of life. He enjoys himself through the day in whatever his avocation may be, and when night approaches he sits in his back porch and watches “Old Sol,” whom he has followed all day-—sink from view beyond the western hills. This continues day after day. Do you call it monotony? Why, no! For each day brings with it a change not only of verdure, and consequently of scenery, but of work. And he has, “all seasons for his own[i].” When the Spring first dawns, it brings with it a desire for work, and the work of that season is refreshing. And when the buds begin to put out and the ﬂowers to bloom, and the earth becomes dressed in its garb of beauty, he is then sowing that he may reap. Still onward time passes; the summer months come and-go, and beautiful autumn with its many colored ﬂowers greets him, as he puts in his hand to gather the result of his early sowing. This garnered, he is ready for the chilling blasts of winter; and around the blazing ﬁre he sits as the long wintry evenings pass, and recall stories of other days, or discuss the happenings of the present. “God made the country, man made the town.” O, who would not be a country boy? The long drought was brought to an end on Saturday afternoon, when it begun to rain, and the water felt all night in copious showers. If this has not been the longest drought ever known at this season, its effect has been greater than any ever known. Noticeably in the branches which are denuded of their luster, Beaver Dam Branch which was never known to be without water before, was dry last week. Wheat has suffered much, but may, possibly, regain a part of its annual vigor. The slate for the roof of the building for the Sussex Safe, Trust, Title and Deposit Company has arrived, as has also the entablature. 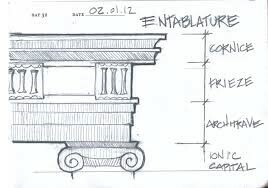 It has always been the practice in this locality to put the various parts of the entablature on a building separately. This one, however, is something new; it is made of metal, and all in one piece, consisting of the architrave, frieze, facie and cornice, and when put in place will cover all the woodwork of the eaves. There will also be an ornament of metal extending along the ridge of the roof, and at each end a pyramid about six feet high. In style and structure, this building is a fine one, and the only fault we can find with it, is its location. Could a more elevated piece of ground have been obtained by the company for it, its beauty would have enhanced the appearance of the town to a far greater degree. Mr. Nailor expects to have the building ready for occupancy by January. Mr. Nailor has completed the building of H. P. Burton’s except the stairway, and awaits the arrival of material to complete the job. The two buildings at Lewes are nearly ﬁnished, and when these shall have been completed, Mr. Nailor will have finished all the jobs he has commenced during the year. Mr. David Dickinson is repairing his home at the corner of Magnolia and Mulberry Streets. Justice-of-the-Peace Eli L. Collins shipped a carload of hickory butts to a northern market last week. Mr. W. E. Manship, of Denton, was in town last week, and has had the sidewalk in front of his property on-Federal Street curbed and ﬁlled in with dirt, an improvement that was badly needed. Mr. Manship returned to Denton on Saturday. Captain John Fisher is at home spending a few days of enjoyment with his family, away from the cares of a seafaring life. The cold weather of the past week froze the river over on Wednesday and Thursday nights. Schooner James A. Carey, Capt. Charles Mason, is at Milton dock loaded with coal for Capt. C. H. Atkins. The committees, as well as teachers, of some of the school districts around Milton, are exercised over the distribution of the school fund; they not having raised last year the necessary one hundred dollars to entitle them to the dividend. They await a solution of the difficulty. The infant child of Norman Wilson, died on Thursday night. Interment was made in the M. E. Cemetery on Friday morning. Mr. Louis Benero, of the Hart House, returned from Philadelphia on Wednesday with mules, which he offers for sale. Will Johnson left town on Saturday for Atlantic City, where he will engage at carpentry. James Ponder, Esq., attorney-at law of Wilmington, with his bride, is visiting his mother, Mrs. Sallie Ponder. It is stated there is $384,521 paid to pensioners in Delaware. It is reasonable to suppose that most of -this money is spent in Delaware; and yet many people, and some of them business men, are opposed to pensions. Dr. W. J. Hearn’s naptha launch is at Milton dock, laid up for the winter. Miss Janie Wilson lost the stem wind from her watch on Sunday evening, either at church or on the way home. “World’s Temperance Day” was observed by the Sunday School of the M. E. Church last Sabbath. Dr. R. B. Hopkins, who is an adept in the scenic work portrayed, for the ediﬁcation of the school upon a blackboard, the M. E. Church, the Milton school building, and a private home; all of which looked beautiful—-as it was done with different colored chalk–and was greatly appreciated by both teachers and the school. W. W. Conwell, manager of the Milton depository of the Lewes National Bank, is distributing a very pretty calendar for 1902. The design is beautiful, representing three little boys having a regular jubilee under the shade of the tree, and away from the old folks, whose mansion stands partly hidden in the background. It is very probable we shall have two canneries running in Milton during 1902. These will be built by stock subscription: almost all, if not the entire stock being taken by our citizens. The one to be built at the depot will be operated by Messrs. Ward & Merritt, of Warwick, Cecil County, Md. The one to be built on the sight [sic] of the one recently burned, will be run by A. F. Anderson, of Havre de Grace, Md. The extra meetings that have been held at the M. E. Church for four weeks closed on Sunday evening. Arrangements are being made to hold an entertainment in School Hall, on Christmas night, for the benefit of the Milton Fire Company. We shall endeavor to keep this item before the public until the time arrives. [i] The first published example of this phrase much used in 19th century writing is in a poem by Felicia Dorothea Browne Hemans (1794-1835), “The Hour of Death.” In this instance, it is Death who has “all seasons for his own,” as well as “all places for his own.” In another work, an opera by George Pope Morris titled “Maid of Saxony,” it is Love who has all seasons for his own. David A. Conner frequently quotes Hemans in a variety of contexts, some of which appear incongruous.